Three years ago, a civic leader here in Harrisburg, Pennsylvania, told us that she believed if more people had “someone to tell it to” in their lives, very possibly there would be fewer acts of violence, fewer incidents of abuse, and fewer mass shootings across our land. Three years later, we are utterly saddened and not a little angry that yet another public tragedy has devastated another U.S. community. The toll this violence is taking is profound. On Valentine’s Day, no less – a day that is supposed to be about love. On Ash Wednesday, too – a sacred day for more than a billion people around the world, a day of self-examination and atonement. Where do we need to atone? Where do we need to examine our hearts? Where do we need to love even more? I find myself wondering in cases like this, didn’t anyone care about Nikolas Cruz? His adoptive mother died last November and his father died several years ago. He was considered odd but was often friendly and outgoing. He was expelled from school for misbehaving. He lived with “friends”. Did anyone really reach out to him? Did anyone care that he was alone? No family, no friends. I am by no means excusing what happened; I have 4 grandchildren in public schools. But how did Nicholas manage with no one caring, it seems, whether he lived or died. “Just needed to get that off my chest. I think how different things might have been if he had had someone to tell it to. Yes, “someone to tell it to”. 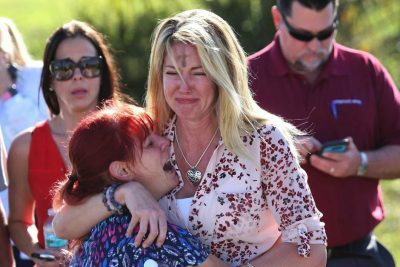 Maybe things would have been different for Nicholas Cruz and the 17 students and teachers he killed and the many others he wounded and all those who love them today. Someone To Tell It To exists quite simply to listen intentionally and compassionately to those among us who experience loneliness, grief, depression, heartbreak, and who have questions about the purpose and meaning of their lives. We also exist to mentor others to do the same. We want to sustain and grow a movement in which everyone knows he matters, in which everyone understands she is valued, in which everyone of us can receive the care and support we need. So that violence might stop. So that abuse might end. So that mass shootings might never need to be a headline again. How might you listen more intentionally, reach out more compassionately, and help this movement deepen? We’d love to hear from you to learn how you might join us in helping things to be different beginning today.